Will You Come to Your Own Rescue Before It's Too Late? A lot of what I write about on this blog and other sites [You can get a full update of ALL my posts by subscribing to my email newsletter] is about nonprofits acting to help themselves, as opposed to waiting on bended knee with cupped hands for someone to help them. I've written before about my disinterest in charity. I'm much more interested in people and nonprofits helping themselves in whatever way possible. Let's save the charity for those causes that really need it. That's why I love these monks in Louisiana. 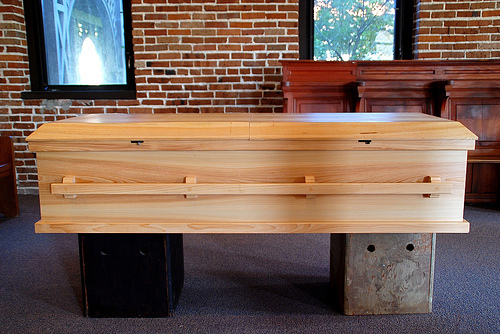 They make and sell wooden coffins. The money they make supports the abbey. When funeral homes objected, the monks took their case to court and won. They make their own money, and when someone tried to take it away they battled back. Nonprofits need the same resourcefulness, spirit and courage. Tomorrow on the For Momentum blog I'm writing about someone else who had courage, but was no saint: Alfred Hitchcock. Convinced in 1959 that a book on a deranged man who lived with his dead mother had the potential to be blockbuster movie, Hitchcock mortgaged his home and put his reputation on the line to self-finance the movie Psycho. Hitchcock had no marketing budget - and his studio, Paramount Pictures, wasn't eager to distribute the film - so he focused his grassroots efforts on promoting Psycho in just four movie theaters. The rest is history. Psycho was a huge success and is regarded as Hitchcock's best movie. Hitchcock has some important lessons for cause marketers. Read what they are here.